The Greenwood Farmhouse is a 100 year old home in the Greenwood neighborhood of Seattle. The homeowners came to H2D Architecture + Design with a vision for a whole house remodel that would be broken into several phases for budgetary reasons and to allow the homeowners to live in the home during construction. 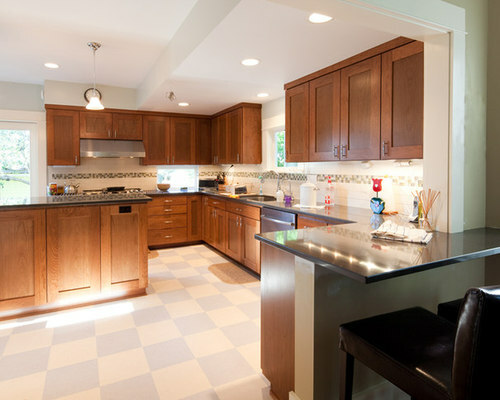 The first phase included a main floor kitchen remodel, deck addition, and addition of a second floor bathroom. 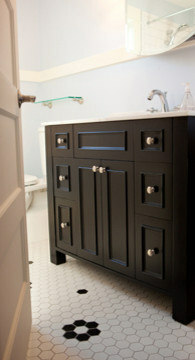 The design intent was to bring back traditional detailing into the home that harkened back to the era of the home. With a mix of traditional details and a modern twist, the project came together beautifully. Future phases for the home include a second story addition with a master suite. Greenwood Farmhouse kitchen and bathroom remodel by H2D Architecture + Design, www.h2darchitects.com, info@h2darchitects.com. Photos by Chris Watkins Photography. 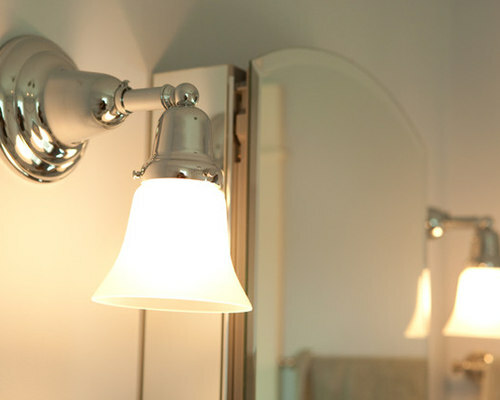 The bathroom is designed to harken back to the traditional style of this 100 year old farmhouse. 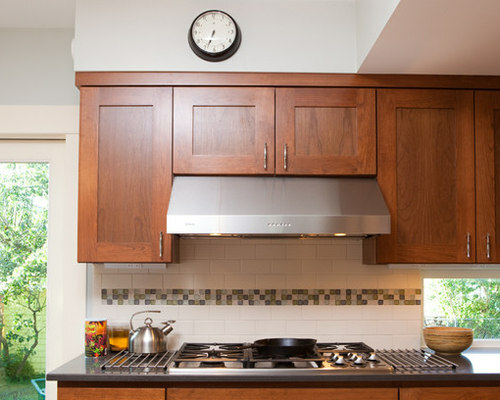 The cabinetry above the refrigerator is design as pull out cabinets. 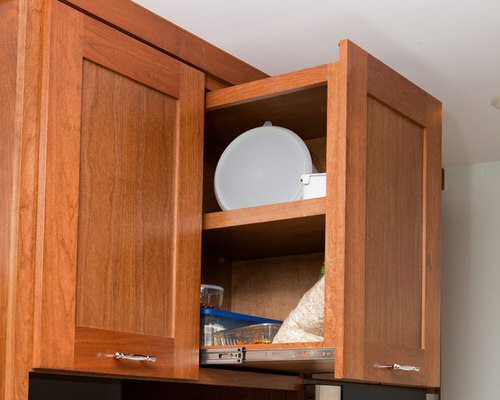 The pull out cabinets are accessible from one side as shown in the image. 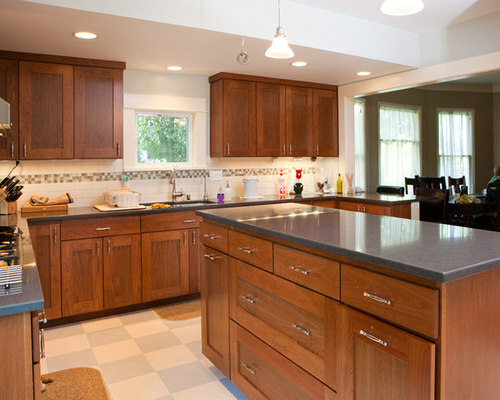 The cabinets are a custom made shaker style cherry cabinet. Greenwood Farmhouse kitchen and bathroom remodel by H2D Architecture + Design, www.h2darchitects.com, info@h2darchitects.com. Photos by Chris Watkins Photography. Greenwood Farmhouse kitchen and bathroom remodel by H2D Architecture + Design, www.h2darchitects.com, info@h2darchitects.com. Photos by Chris Watkins Photography. 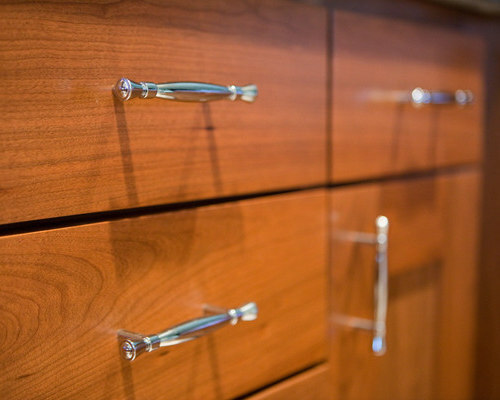 Detail of the corner cabinet. 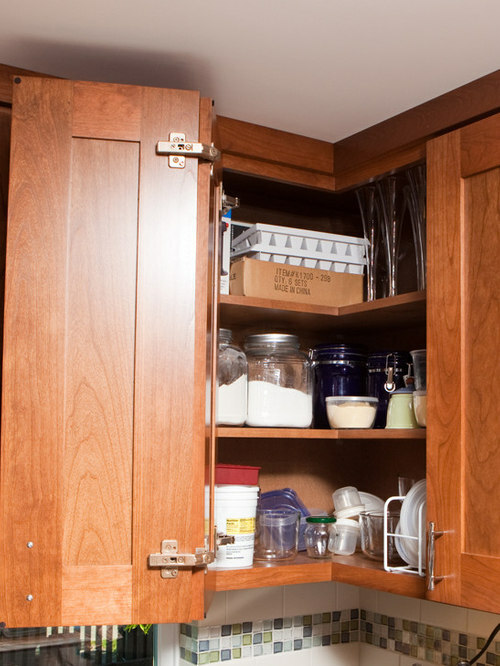 The goal was to maximize space and access to this corner cabinet, usually a tough spot to access. Greenwood Farmhouse kitchen and bathroom remodel by H2D Architecture + Design, www.h2darchitects.com, info@h2darchitects.com. Photos by Chris Watkins Photography. 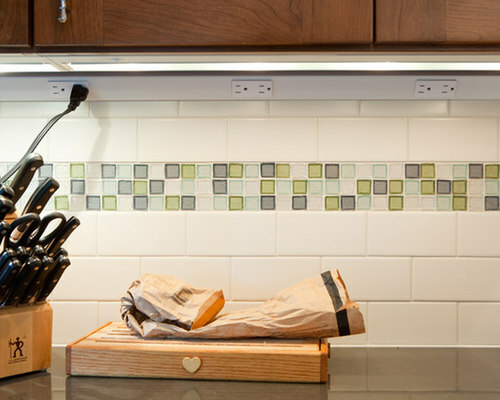 Detail of the white subway tile and recycled glass backsplash. Greenwood Farmhouse kitchen and bathroom remodel by H2D Architecture + Design, www.h2darchitects.com, info@h2darchitects.com. Photos by Chris Watkins Photography. Greenwood Farmhouse kitchen and bathroom remodel by H2D Architecture + Design, www.h2darchitects.com, info@h2darchitects.com. Photos by Chris Watkins Photography. 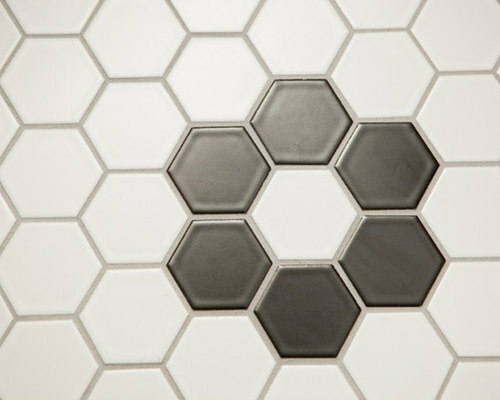 The bathroom flooring is white hex tile with a rosette pattern to harken back to the traditional style of the existing home. 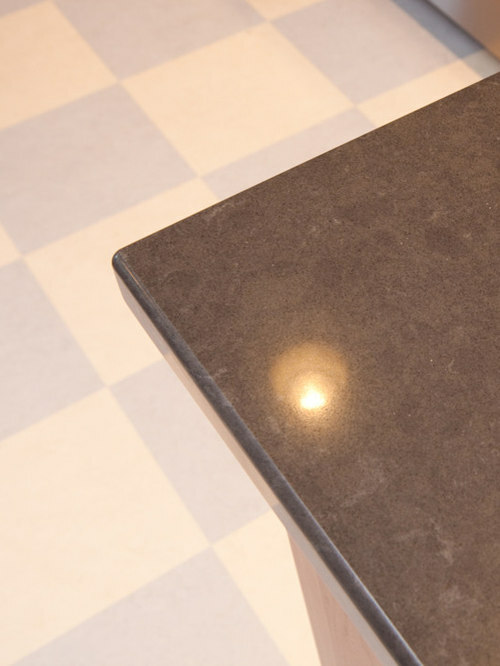 A grey grout is used. 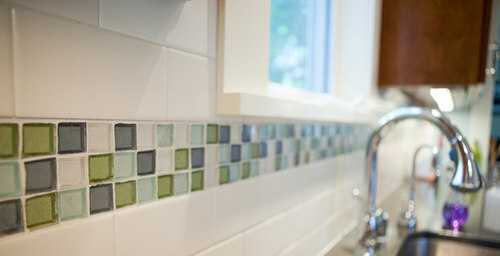 Greenwood Farmhouse kitchen remodel by H2D Architecture + Design, www.h2darchitects.com, info@h2darchitects.com. Photos by Chris Watkins Photography.